Roasted or toasted, however you like to describe it, this marshmallow infused ice cream is much more than just a summery treat to cool off with. Although it stands deliciously well on its own, I’m leading you somewhere with this ice cream. Today and tomorrow’s recipes are essential to Friday’s, so make sure you don’t miss out! As I was searching for a marshmallow ice cream recipe to try, I only came across very few. Most instructed to broil or torch store-bought marshmallows and mix them into the custard. Others didn’t toast the marshmallows, and instead just melted them in a sauce pan. I didn’t have store-bought on hand, and I knew I wanted a toasted flavor, so I went with a recipe where I had to make my own marshmallow meringue then roasted it in the broiler. It might sound very difficult, and it is a little bit more involved, but the satisfaction of whipping up my own marshmallows and then turning into ice cream was one that will keep me making this recipe over and over. 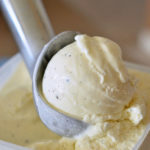 Plus, after you see Friday’s creation, you’ll understand even more my need to make this ice cream all summer…and fall! 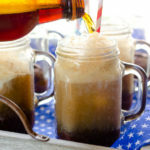 I did drastically adjust the amount of vanilla used in this recipe, as I felt even half of the original amount slightly overpowered the marshmallow flavor, and left out the rum because it is not needed to keep the ice cream soft. I love the flecks of the browned marshmallow meringue in this. If you’d rather use store-bought marshmallows, you can skip the meringue instructions and just spread a 10 ounce bag of standard-sized marshmallows on a lined baking sheet and roast under a broiler until browned. Mix them in a food processor or blender, with the warm custard. Although I haven’t tried this method, it seems it should have similar results. Combine 2/3 cup of the sugar and 1/4 cup water in a small saucepan. Stir until the sugar dissolves, with the heat on low, until it reaches between 236˚-244˚F. Try not to let it boil. (Be patient, as it will take quite a while to reach this temperature.) In the meantime, you can start following the instructions below to make the custard. Once the syrup reaches 230˚F, start whipping the egg whites until reaches soft peaks. Add the cream of tartar and continue to beat until reaches stiff peaks. With the mixer still on, pour the hot sugar syrup into the egg whites in a thin stream. Beat until somewhat cooled, then spread onto a parchment lined baking sheet. Broil for a few minutes, until nicely browned. In a medium bowl, whisk together the egg yolks and 3 tablespoons of the sugar until the mixture is pale yellow; set aside. While keeping an eye on the sugar syrup, warm the milk, cream and salt in a medium heavy saucepan until almost boiling. Temper the eggs by slowly whisking 1/2 cup of the warmed cream into the egg yolks, while stirring constantly to avoid curdling. Slowly whisk in the rest of the cream into the egg yolks, then pour back into the saucepan and continue to heat on medium-low until the custard thickens (about 3-6 minutes). Place a lid on the saucepan to keep the custard warm until the marshmallow meringue is ready. Once the marshmallow meringue is ready, transfer the custard into a large bowl and whisk in the roasted marshmallow meringue. Cover and refrigerate overnight. Just before freezing, whisk the mixture again and stir in the vanilla. Freeze according to your ice cream freezer manufacturer’s instructions. 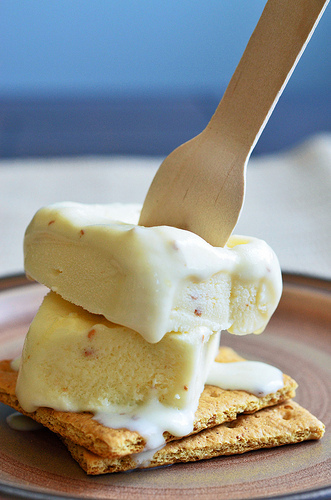 Roasted marshmallow ice cream?! That sounds unbelievable! I absolutely LOVE making homemade marshmallows, but it seems like I always end up with more than I can use. This would be an awesome way to use the rest! Sounds sooo yummy. 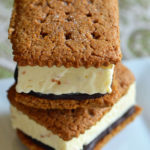 OMG, I seriously have been thinking about tomorrow’s post (which I’m imagining to be some sort of amazing s’more ice cream bar) the entire day! Can’t wait to see it! Oh my, this looks out of this world. 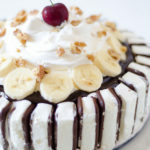 I am definitely going to have to try this!